Komax strengthened its market leadership in 2017, putting itself in a good position to exploit the growth opportunities offered by new technologies such as electro-mobility and autonomous driving. Beat Kälin, how would you assess the 2017 financial year? Beat Kälin: In 2017, Komax reached a number of important milestones on its way to fulfilling its ambitious medium-term targets for 2017–2021. These include the successful launch of numerous new products, the step-by-step integration of the companies acquired in 2016, the expansion of the Group’s market presence in Asia, the acquisition of Laselec, the booking of the first major order from the aerospace industry, and the start of work on the capacity expansion in Dierikon. So is Komax on track from a strategic perspective? Beat Kälin: The automotive market, which is by far the most important market for us, is going through a fascinating period right now. Themes such as electro-mobility and auto­nomous driving will change the industry. As market and technology leader, we have the opportunity to actively shape this transformation and further strengthen our leading position. In 2017, we took a number of steps to achieve this and thus lay the groundwork for lasting success. Matijas Meyer, what have you done specifically? Matijas Meyer: New technologies bring new challenges. If we are to meet these challenges, it is crucial that we get to grips with them at an early stage. This is the only way of ensuring that we can bring new solutions to market. A good example of this is electro-mobility. True, only just over 1% of the 95 million vehicles produced globally in 2017 had electric engines. So the number of high-voltage wires requiring incorporation into car engines is still relatively low. But we have nonetheless been preoccupied with this theme for quite a while now, and were therefore able to bring a number of convincing solutions for the processing and testing of high-voltage wires to the market in 2017. Thanks to the high-voltage center of competence we established in Hungary last year, we are well positioned to deal with the eventuality of electric vehicle production rising dramatically over the next few years. What kind of potential do you see in autonomous driving? Matijas Meyer: Autonomous driving essentially offers us far greater opportunities than electro-mobility. Because the former phenomenon requires a very large number of sensors, which accordingly means additional wires to be processed. What’s more, the very highest quality – to the point of zero tolerance in the error rate – is called for, as is the seamless traceability of the individual process stages. This by definition requires the deployment of automation solutions, which is very positive for us. Thanks to our targeted investment in research and development, I am confident that we are very well equipped to meet the challenges of autonomous driving. You spent a record CHF 36.7 million on research and development in 2017. Was that a strategic decision? 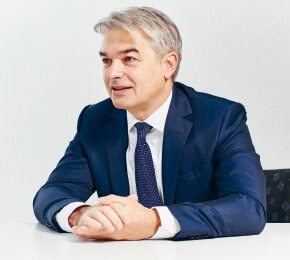 Beat Kälin: Due to the developments mentioned earlier, the automotive industry is currently in a state of upheaval. In addition, there are a number of trends unfolding that will keep ratcheting up the pressure on manufacturers to automate wire processing. So the companies that want to be successful in the future need to be investing now – because the next few years will decide who has the edge in these new technologies. Obviously we are determined to remain the number 1 and increase our advantage even further. It was therefore a strategically important decision to increase our investment in research and development to 8%–9% of revenues. Matijas Meyer: In the short term, this higher expenditure will mean slightly less strong growth in EBIT. But we are absolutely convinced that this investment will pay off in the medium to long-term, thus enabling us to achieve our ambitious 2021 EBIT target of CHF 80–100 million. Matijas Meyer: We are continually working to improve our operational excellence and thereby increase profitability. For 2018, we are anticipating an increase in EBIT in absolute figures. However, given the very high sums we are continuing to channel into research and development and the ever-greater proportion of customer-specific systems, there will be limits to our ability to increase the EBIT margin this year. Are these customer-specific systems comparable to the systems business of the Medtech business unit, which you divested back in 2016? Beat Kälin: Our first response to new challenges in the market is typically to develop customer-specific solutions. Only once demand has reached a certain critical size do we start the cost-intensive process of developing a serial production machine. We therefore aim to develop a serial production machine or at least a modular solution once it has become clear that demand is sufficiently great, as well as standardized. At the moment, for example, we are proceeding with the development of the first solutions for the processing of high-voltage wires. However, these customer-specific systems are not comparable to the high-risk systems business, as the corres­ponding orders are significantly smaller than they were for Medtech. More-over, the orders we receive now always relate to our core area, in other words, the automation of wire processing. How did the business with serial production machines develop in 2017? Matijas Meyer: Our new Alpha 530/550 machine platform has enabled us to successfully penetrate the market in our core business (crimp to crimp) in all regions. The new machines are proving very popular with our customers, and have replaced existing products much more quickly than we had expected. In 2017, we launched a number of new products along the entire value chain. This investment of personnel and financial resources has been rewarded: The market has received our new solutions very quickly and positively. As is customary after all new product launches, we will now set about optimizing our production processes continuously so that we can gradually improve profitability. In 2017 you received your first major order from the aerospace industry. Did the client in question order serial production machines or customer-specific systems? Matijas Meyer: Basically these are customer-specific systems, though they are based on the serial production machines of the Zeta type. The receipt of this seven-figure order in 2017 was a milestone that we have been working for years to achieve. This project is only implementable because we can bring together experts from different fields who possess great expertise and offer outstanding solutions for individual process stages. These also include the laser applications of our subsidiary Laselec. Thanks to our systems, the automation of wire processing in the aerospace industry will reach unprecedented levels. That’s why we are confident of being able to win further customers and generate further orders in this market segment over the next few years. Are large orders of this kind the reason why the order intake has risen more strongly than revenues? Matijas Meyer: Customer-specific systems tend to have longer delivery times, which is one of the reasons for the high current book-to-bill ratio of 1.10. Another reason is that some CHF 10 million worth of machinery is already complete or nearly complete, but has not yet fed through into revenue. That makes it all the more impressive that we have still been able to boost revenues by 9.6%. Of that figure, the lion’s share – or 6.0% – was organic. I was particularly pleased to see the order intake increase by 21.5% to some CHF 450 million. This rise shows that we were able to increase our market share, and that we are on course to achieve our ambitious targets for 2017–2021. This is all down to the work of more than 1 800 Komax employees, who played such a large part in our ability to excite our customers time and again with new solutions in 2017. So many thanks for this outstanding commitment! Komax generated higher Group profit after taxes (EAT) in 2017 than it did in 2016. So why have you not increased the dividend? Beat Kälin: In our 2017–2021 strategy, we specified that the payout ratio would amount to 50%–60% of EAT. With the distribution proposed by the Board of Directors, we are paying out more than 59%, right at the top end of that bandwidth. In addition, you should not forget that we will be investing more than CHF 90 million in infrastructure projects over the period 2017–2020. So it’s actually a very positive sign that we can distribute more than 59% of profit to our shareholders, despite this high level of investment. Is that investment a response to capacity issues? Matijas Meyer: There are a number of different reasons for the various construction projects. At our headquarters in Switzerland, work began in August 2017 on a large new production and office building encompassing some 20 000 m2. The goal is for all employees in Switzerland – who are currently spread across three different sites – to be based at our headquarters one day. The new building is expected to be ready for occupation in the second half of 2019. As I mentioned earlier, we are currently in the process of buil­ding up our high-voltage center of competence in Hungary. In order to meet the rising demand for high-voltage solutions in the future, we need significantly more capacity. As things stand, we are expecting the new building to be completed by the end of 2018. And why are you building in Germany? Matijas Meyer: Komax SLE in Grafenau is our center of competence for infotainment and high-frequency technology in the automotive sector. The customer-specific systems we build there will be increasingly in demand, particularly in connection with the theme of autonomous driving. We will be more than doubling the existing space with an extension that will provide enough room to build all the systems we require. In addition, the demand for taping and assembly technology is also on the rise. We are therefore constructing a new building for Kabatec in Burghaun. We are planning to complete both of these construction projects by the end of 2018. In addition to your building projects, you are also investing in digitalization. Which has the greater priority? Beat Kälin: We need both! In 2017, we introduced a new ERP system in Switzerland and in Singapore, which will be important if we are to simplify processes and increase efficiency. However, we have a fair bit of homework to complete before we reach that stage, which is not uncommon for a large ERP project of this kind. We will be introducing ERP at other locations over the next few years. Digital transformation is essentially a key strategic theme for Komax. It encompasses not just internal digitalization, but also supporting customers during this transformation. Matijas Meyer: By developing solutions that enable them to implement industry 4.0 in their production processes. For example, our operating software Komax HMI, which we launched in 2017, allows our customers to network their machines with a manufacturing execution system. This means they can analyze their production data in real time, at any time. All data is documented and therefore traceable without exception. So in the event of a vehicle model being subject to a general recall due to an error in its wire processing, this traceability is a huge benefit. Because this means the prob­lem can be better contained, which in turn means a significant reduction in the number of vehicles that have to be recalled. We are currently working on a number of different digitalization themes that will help us to offer our customers greater added value over the coming years. What are the big themes on your agenda in 2018? Matijas Meyer: As mentioned earlier, we are investing strongly in research and development, as well as in new production sites. Adhering to our budgets and achieving our targets will require us to maintain a sharp focus here. The optimization of our processes is an ongoing theme. We have had to work on that continuously as a result of the huge growth – both organic and acquisition-based – achieved over the last few years. Process optimization is a crucial aspect for us if we are to continue to increase pro­fitability. The integration of the companies and employees acquired in 2017 is another area of focus. There are numerous other themes that I could mention too. But in summary, I can confirm that I am very confident that we will make further progress in the implementation of our 2017–2021 strategy in 2018 too.